Can I setup pre-pay contracts and retainers? / Project Management / Can I setup pre-pay contracts and retainers? You can and Intervals handles this scenario really well. When we first built Intervals we were doing a healthy amount of web development on the Pelago side of our business. We typically did custom development projects that were followed up with maintenance contracts. We would offer pricing discounts on our hourly rate based on how much the client purchases up front. The more they buy the bigger the discount. This helps generate cash flow and the client gets a break on the hourly rate. Here is an example of our maintenance contract if you are interested. 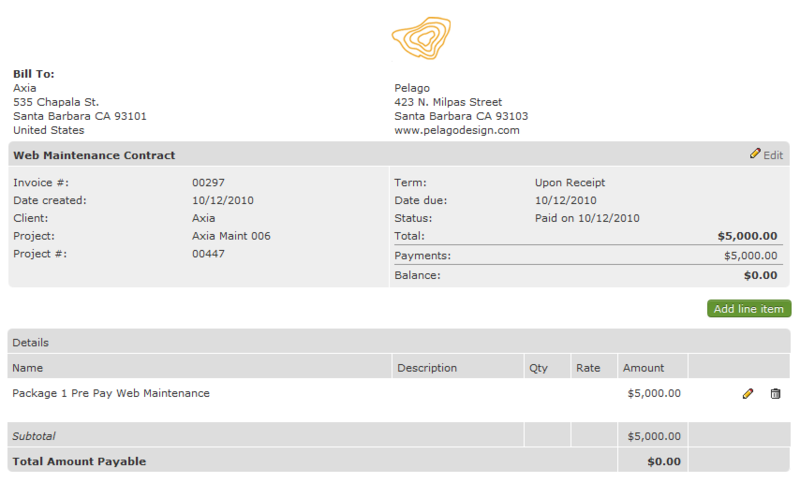 Create a free form invoices with the package they selected as the line item (Pre Pay Web Maintenance : Package 1 : $5,000 for example). 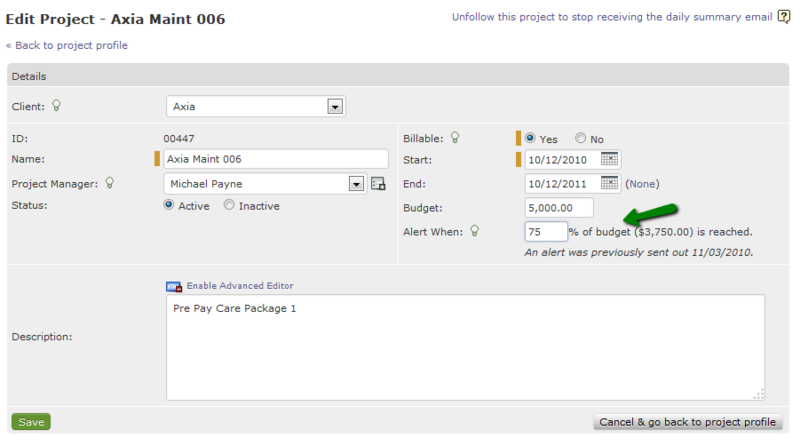 Set a budget alert at the project profile to let you know when a certain project threshold has been reached. We typically would set it at 75% for maintenance contracts so we have a heads up that the prepayment is close to being used up. Track all of our hours as billable. This will help show you when the amount of work has exceeded what has been paid for. The project dashboard will show the high level financial state of the project and whether or not it still has a credit. If you need to show a detailed report to your client showing where the hours have gone, the project activity report with “by task” selected in the summary drop down is ideal. The top half of the report will show all of the totals and the bottom half will show the financial value of each individual task. If you are going to continue working with the client we would allow our maintenance customers to extend the contract by making another payment. If the work was complete and there was no need to extend the contract but there was an overage, a free form invoice could be generated with a line item with the final overage. Can I create a quote or estimate that a client signs off on? Does Intervals include CRM functionality?